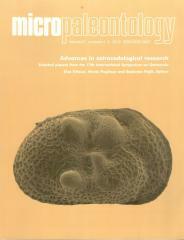 ABSTRACT: Five new species of ostracods, Paralimnocythere musacchioi n. sp., Paralimnocythere aucamahuevoensis n. sp., Wolburgiopsis ballentae n. sp., Looneyellopsis multiornata n. sp. and Vecticypris punctata n. sp. are described. The significant number of Limnocytheridae taxa shows the importance of the family in brackish to freshwater Campanian-Maastrichtian sediments of the Allen and Loncoche Formations (Neuquén Basin, Argentina) and provide new paleogeographic and biostratigraphic data of each genera. Our results extend the paleogeographic and biostratigraphic range of the genera. Looneyellopsis has a widespread geographic range through Late Cretaceous, and documents affinities with associations from Southern Europe of the same age. Vecticypris is the only genus of Timiriaseviinae which is represented, so far, in the uppermost Cretaceous deposits of the Neuquén Basin.Anew species of Wolburgiopsis confirms the great significance of this genus in the Upper Cretaceous.